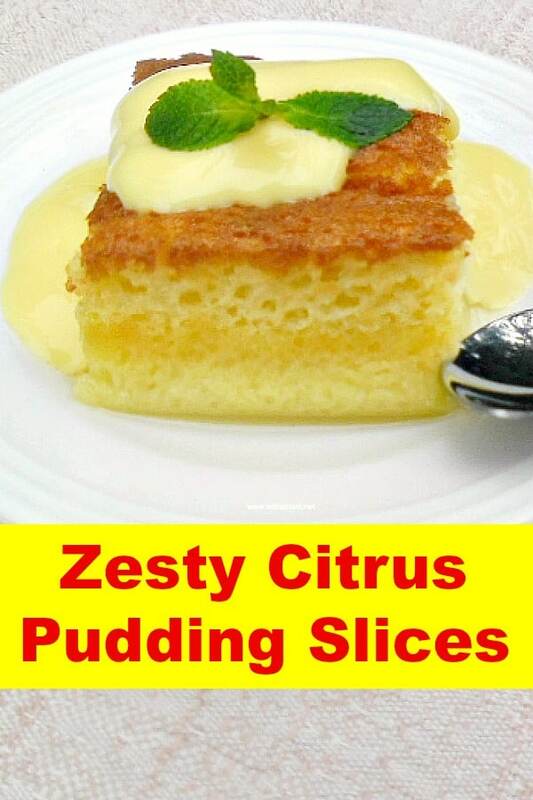 This Zesty Citrus Pudding slices recipe has a light sauce at the bottom and soft cake on top – the ideal comfort dessert during cold weather ! Autumn has started here in South-Africa and the mornings and evenings are definitely chillier than a couple of weeks ago. We are now in that phase where we still want our Summer eats, but also a something warmer for dessert at night. These Citrus Pudding slices are perfect – zesty, served slightly warm with a thin custard. The pudding forms a bit of sauce at the bottom, which soaks into the cake just enough to make it a delicious gooey bite from the bottom, with the soft, less moist cake top. If you are looking for a quick, comforting Winter dessert, which I would put between a pudding and a cake, then this recipe is for you. 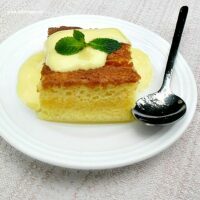 This Zesty Citrus Pudding slices recipe has a light sauce at the bottom and soft cake on top - the ideal comfort dessert during cold weather ! Take care when removing the pudding from the oven dish as it is saucy at the bottom – an egg lifter works great! 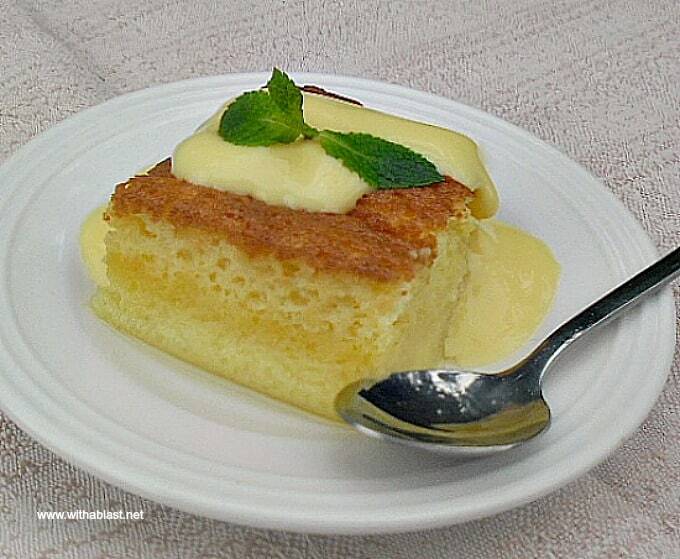 Serve warm with thin custard. Take care when removing the pudding from the oven dish as it is saucy at the bottom – an egg lifter works great! I know exactly what you mean I've been baking now autumn is here and I even have a quilt back on the bed, man I love autumn. I have about 6 weeks until the new lemons are ripe from feb through April they're all green. Oh the perfect summer dessert and just in time! Citrus anything is yummy for me! I'm visiting from Tip Me Tuesday! That looks like a great dessert. I will have to try it! I made it. It is very good. Perfect after a light supper. This looks delicious. In Canada we are just starting Spring, and I am most defiantly craving summer. This looks like it would fit the bill perfectly.